With just four weeks until the end of the school year, Ramona Unified School District officials have school graduation and promotion dates on their calendars. Mountain Valley Academy Grade 8 — Monday, June 5, 9 a.m. Ramona Community Campus, 1010 Ramona St.
Mountain Valley Academy Grade 12 — Monday, June 5, 5 p.m., Charles R. Nunn Performing Arts Center at Olive Peirce Middle School, 1521 Hanson Lane. Ramona Elementary Grade 6 — Wednesday, June 7, 8:30 a.m., 415 Eighth St.
Barnett Elementary Grade 6 — Wednesday, June 7, 9 a.m., 23925 Couna Way. James Dukes Elementary Grade 6 — Wednesday, June 7, 9 a.m., 24908 Abalar Way. Hanson Elementary Grade 6 — Wednesday, June 7, 9 a.m., 2520 Boundary Ave.
Mt. Woodson Elementary Grade 6 — Wednesday, June 7, 9 a.m., 17427 Archie Moore Road. Ramona Community Montessori Grade 6 — Wednesday, June 7, 9 a.m., 1010 Ramona St.
Montecito High School Grade 12 and Future Bound Independent Study — Wednesday, June 7, 6 p.m., 720 Ninth St.
Olive Peirce Middle School Grade 8 — Thursday, June 8, 9 a.m., Ramona High School Stadium, 1401 Hanson Lane. <bullet> Ramona High School Grade 12 — Thursday, June 8, 7:30 p.m., RHS Stadium, 1401 Hanson Lane. 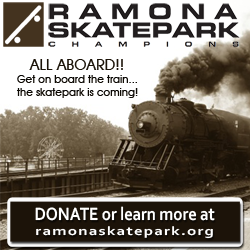 For more information about each event, see the individual school websites online at www.ramonausd.net.